A frequent concern owners bring up is the risk of their pets and themselves acquiring Borreliosis (Lyme disease). Data shows the Mid-Atlantic region being a highly exposed region with a much higher than average concentration of Lyme positive people each year. This blog article gives an in-depth description of how we work to reduce the prevalence of Lyme disease in humans and our pets with vigorous preventative measures. Lyme disease is an infectious disease by a spirochete bacterium called Borrelia burgdorferi. The disease is spread by ticks and can infect humans and dogs as well as other mammals and can even be carried by birds. Lyme disease causes a varying degree of morbidity in humans and animals with variable signs ranging from flu-like illness to death from kidney failure. Lyme disease cannot spread directly from humans to animals and vice versa as a tick is required. The CDC confirms that of the 26,000 US-cases of Lyme diagnosed in 2016, nearly 10% of them were in the DC/VA/MD area. Tick prevention is considered the first step and first barrier in fighting Lyme disease. There are several products on the market with variable efficacy. Some products work on repelling the ticks, some work by killing them. The most effective and safe products will typically only be available from your veterinarian. Remember: the correct tick preventatives, such as afoxolaner (NexGard), will also help in reducing the tick population where used. Appropriate tick prevention reduces the tick’s contact time with the dog, helps in controlling the tick population and reduces the risk of Lyme disease. Vaccinating your dog is the best way to reduce the risk of your dog acquiring Lyme disease. Although the vaccine does not protect you and your family, it significantly reduces the risk of the ill effects the borrelia bacterium has on your dog (the active Lyme infection causing kidney failure, joint disease and more). The vaccine produces an antibody response to help your dog attack the infection very early as well as reducing the risk of Lyme-associated illnesses. Please note that the vaccine does not repel the tick or kill the tick, which is why it is important to use a tick preventative in addition. As aforementioned, the best approach to preventing Lyme disease is a combination of a tick preventative and using the Lyme vaccine. In addition, annual Lyme testing is helpful in determining exposure. At our hospital, three drops of blood is enough to test for Lyme exposure. The blood is run through an enzyme-linked immunosorbent assay (ELISA) snap test which detect natural antibodies against the Borrelia bacterium. 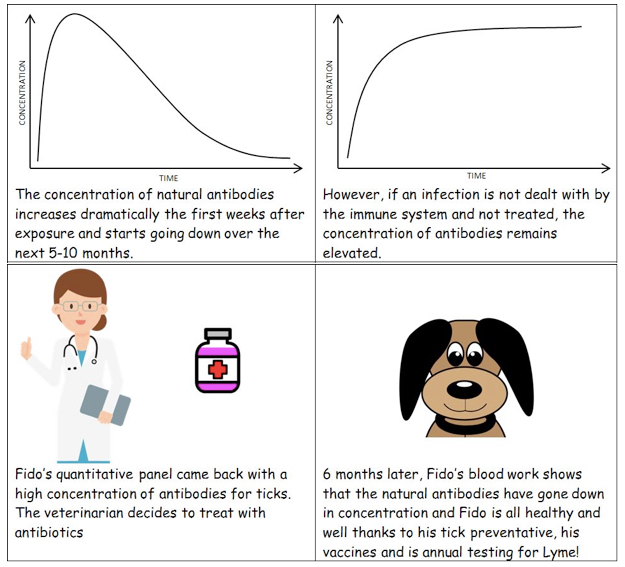 The test only looks for natural antibodies and therefore a positive results means that the dog has indeed been exposed to the Lyme bacterium. Please note that a positive antibody response does not equal an active infection, but rather indicates that the immune system is/was once exposed to Lyme. Previously exposed patients can remain Lyme positive for the rest of their lives although no real disease exists. This is something we come across on a weekly basis and it is imperative that we, as veterinarians, help explain why this happens. 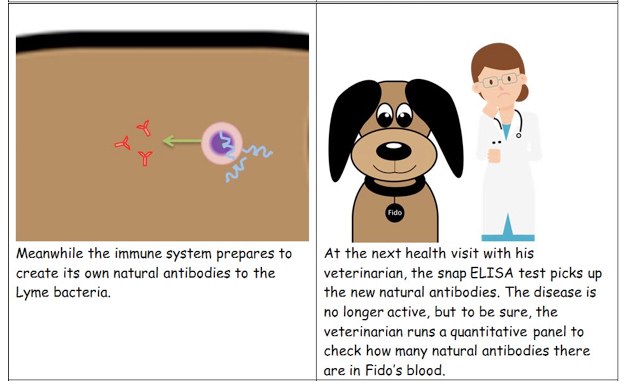 The snap ELISA test only looks for “natural antibodies”, meaning a positive result can only be from exposure to the real Lyme bacterium (Borrelia burgdorferi) and not the antibodies from the vaccine (“vaccine antibodies”). 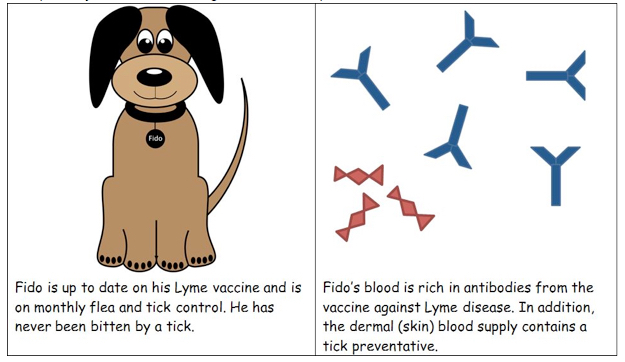 Any dog can test positive for Lyme despite being on appropriate tick preventatives as the tick needs to bite the dog to be affected by the active ingredient in the preventative medicine. 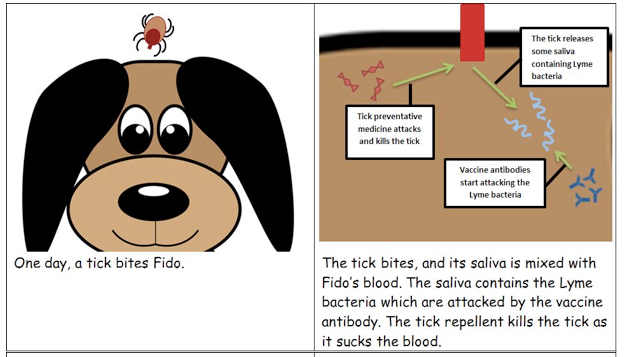 • Appropriate tick prevention reduces the tick’s contact time with the dog, helps in controlling the tick population and reduces the risk of Lyme disease. • Testing annually helps identify exposed dogs, give them treatment when deemed necessary, and thus help monitor your dog’s health.